It's officially begun! 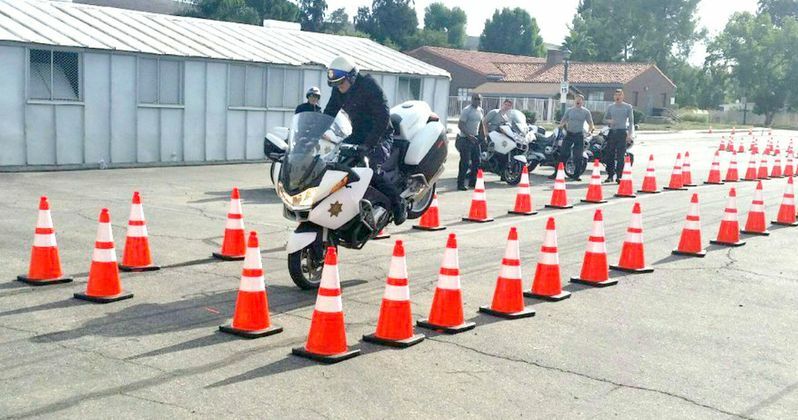 The big screen adaptation of the popular TV show CHiPs is underway in and around the Los Angeles area. And director/star Dax Shepard has shared some exciting first look photos from the set. We also get our first look at co-star Michael Peña suited up and on his motorcycle. After watching his performance in Ant-Man, should we worry that the California highways aren't exactly in safe hands? In the original series, California Highway Patrol motorcycle officers Jon Baker and Frank "Ponch" Poncherello cruised the freeways of Los Angeles, solving crimes and helping people in trouble. The stakes usually weren't very high, the better to highlight the personal lives of its two main characters. The show debuted on NBC on September 15, 1977 and ran for 6 seasons. While the season finale aired in May 1983, it wouldn't be the last we'd see of Ponch and Jon. Stars Erik Estrada and Larry Wilcox would reprise their roles a decade later for CHiPs '99, a made-for-TV movie that aired on TNT. It is rumored that both Erik Estrada and Larry Wilcox will have cameos in this new version. Dax Shepard is taking on the role of Officer Jonathan "Jon" Baker, while Michael Peña is assuming the much more popular character of Officer Francis ("Frank") Llewellyn "Ponch" Poncherello. The film has been described as a buddy cop action comedy. And there will be a heavy emphasis on the word action. Not only is Dax Shepard directing and starring in the movie, he also wrote the script. It will also be a family affair for the former Parenthood star. His wife, Kristen Bell, perhaps best known for her starring role in the TV and movie series Veronica Mars, is taking on a supporting role. She'll be joined by an ensemble cast that includes Vincent D'Onofrio as the villain, Rosa Salazar, Adam Brody, Jessica McNamee, Vida Guerra, Rene Moran and Kelly Richardson. No further casting has been announced at this time. Expect to hear some additions as shooting continues throughout November and December. CHiPs will still continue to follow the adventures of two police officers who patrol the California highways. Though, Ponch and Jon will be piloting a number of different air, land and sea crafts and are not just committed to the motorcycle this time around. The action comedy is described as a cross between Bad Boys and Lethal Weapon. It is no longer a spoof, as first imagined when the movie almost went into production a decade ago, when That '70s Show star Wilmer Valderrama was attached to play Ponch. Once Dax Shepard came aboard, he decided to play things straight. And if you want a taste of what you can expect, check out the actor's 2012 directorial effort Hit and Run, which he also starred in with his wife. In the meantime, check out these first photos from the man himself. Today is day one of CHiPs! So excited. First time I've ever been 15 minutes early to a 530AM call time.